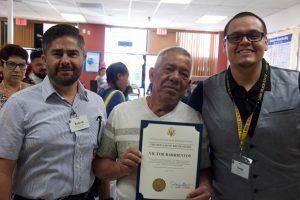 In honor of father’s day and the increasing number of men and fathers participating in the WIC program, two PHFE WIC offices (117th St. WIC and Washington WIC) hosted special events on June 27 and 29, 2018 celebrating the important role of fathers. 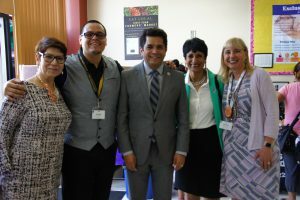 Washington WIC center hosted Congressman Jimmy Gomez, who spoke about the importance of the WIC program’s nutrition education and support in our community. Alex, a loving stay at home dad, is not afraid of rocking matching nail polish with his daughter. Julian, a brand new dad, has been highly involved at each appointment and acting as primary support and caregiver to his wife and newborn. Musie has been part of the WIC family since 2012 and has not missed a single appointment. He helps translate and interpret information at appointments for his wife. Eduardo, whose parents participated in the program when he was a child and now is part of the program for his daughter, walks into the WIC center prepared with parenting and nutrition questions. Victor, a phenomenal husband and father of four (and one on the way), takes an active role in parenting, school meetings, grocery shopping, and cooking. 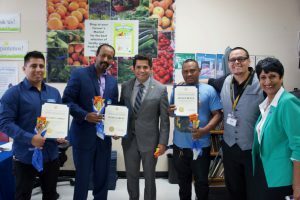 117th St. WIC center hosted Robert Pullen-Miles, District Director for Assemblywoman Autumn Burke, who spoke about the importance of Fatherhood and the WIC program’s contribution to fathers in need. 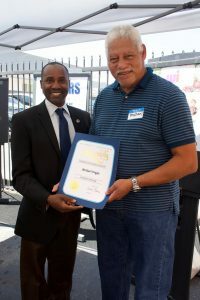 Robert Pullen-Miles presented a certificate that acknowledged a grandfather for his commitment and dedication to his family and participation on the WIC Program for over fifteen years. Michael, a grandfather who has served as the caregiver to his grandchildren, has participated on the WIC program for over 15 years. The celebration included healthy snacks and drinks provided by WIC, carnival games, a beach ball activity, and arts and crafts. 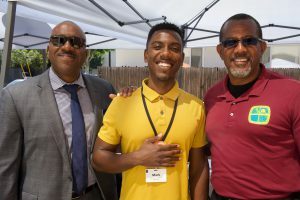 Eisner Dental, Los Angeles County DPSS (Cal Fresh), LIFT, Project Fatherhood, Life Coaching and Fatherhood Principles, Families Uniting Families, D.A.D. Project, and 1736 Family Crisis Center joined the celebration and provided their services. Three guest speakers gave testimonials about the WIC program and about the important role of men and fathers in children’s lives. Lieutenant Robbie Williams received WIC as a youth and spoke about the importance of the WIC program to his family and so many other families in need. Mark Jones II spoke about his early experience on WIC as a child. Mark is now the supervisor at 117th St. WIC. Andy Linares’s parents participated in the WIC program when he was a child, and he now is a graduate from CSUN with a double major in Consumer Affairs and Central American Studies. Carlos Tejeda, a Professor at CSULA, received the support of WIC during his PhD studies. Daniel Polanco, a single dad of a 9 year old daughter and co-executive director of the D.A.D. Project, spoke about how the WIC program provides additional support for young fathers. WIC is here to provide services to ensure our community’s children get a strong and healthy start in life. PHFE WIC is committed to fostering an inclusive and friendly environment for men, fathers, and all other caretakers, parents, and guardians. Research shows children and families do better when fathers and father-like figures are involved. Children exhibit better school performance, increase in self-esteem and improves social relationships. The WIC program offers father-friendly materials such as nutrition education classes, nutrition counseling, parenting courses, and referrals to additional resources to support the entire the family.